I just finished watching an educational DVD that was supposed to provide “simulations” to help parents and teachers develop empathy for kids with Sensory Processing Disorders. Oh, the empathy! I feel better already. The simulations on the DVD were the equivalent of closing your eyes for thirty seconds and then thinking you know what it means to be blind. Proprioception* dysfunction simulation #1: Welcome to class! Let’s get started with the exercises. As you go to take your seat in the classroom, miscalculate how far you are from the first desk in your row, catching your thigh on the corner of the desk and knocking your classmate’s pen and water bottle to the ground. When you bend over to help him pick them up, bang heads with him. Ignore his exasperated sigh and pretend that every single person in the room isn’t either staring at you or carefully avoiding staring at you. Proprioception dysfunction simulation #2 (bonus take home exercise): Pick a morning when you’re late for work. As you get ready to head out the door, grab your coffee mug with enough pressure to get it off the counter, but not enough hang on to it. Curse loudly as it crashes to the floor in a mess of shattered ceramic and hot liquid. Curse some more as you cut yourself cleaning up the shards of ceramic (damn you, fine motor coordination). Repeat daily. Let me know when you’re ready to start adding in the other 6 areas of sensory dysfunction. Now That I’m Feeling Less Ragey . . .
. . . I’ll try some constructive criticism. This DVD felt like a misguided attempt at turning SPD into an “experience” to build empathy in OT students. While the sentiment is admirable, I think the big danger is that once someone assumes they know what another person is experiencing, they stop listening. Perhaps that’s why the creator of this DVD failed so miserably with the simulations portion of the program. If she’d run it by a few adults with SPD, I’m sure the exercises would have looked different. Even better, she could scrapped the simulations altogether and devoted that portion of the program listening to adults and children with SPD talk about what it’s like to have a hypersensitive tactile response or hyposensitivity to pain. Yes, the instructor on the DVD has an OTR/L after her name. That makes her an expert in occupational therapy, not in having an SPD. A five-year-old with an SPD is more of an expert in what that feels like than an adult with a dozen letters after his or her name. As someone who struggles with mild to moderate sensory integration issues, I don’t think it’s possible to create exercises that replicate that experience for neurotypical people. And if the goal is to create empathy for people with SPD, I think there are better ways of going about than a few minutes of engaging in a botched imitation of what it might be like to live with SPD. 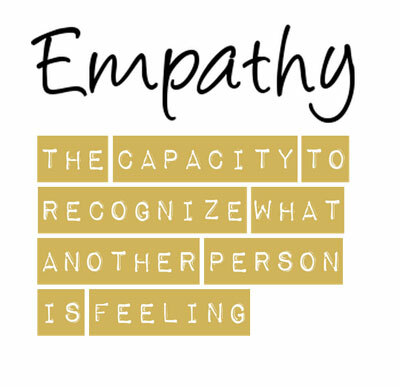 Empathy is “the capacity to recognize what another person is feeling.” Nowhere in that definition is there a requirement to experience first hand through simulations what the other person is feeling. To recognize what someone is feeling, I’ve found it’s helpful to ask questions and listen carefully to the answers. As exercises go, it’s a simple one. And yes, this is the aspie giving advice on empathy. Go figure. *Proprioception refers to your awareness of the position of your body. You can find a great summary of what types of activities might be beneficial for improving proprioception and other physical attributes in children with autism at Physical Exercise and Autism fact sheet. You can find some examples of therapuetic activities for kids with SPD at Activities for kids with sensory processing disorder.